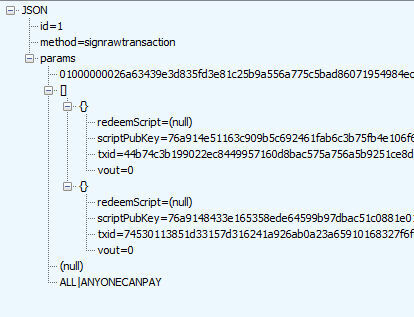 I've been working with BitcoinLib testing various parameters on the signrawtransaction rpc call. It's been mostly successful, however there seems to be a persisting problem when using only private keys to sign a transaction. (second optional argument of signrawtransaction call). The server replies false and returns the failed hex. I have tested the same transaction on the qt console using the same keys, and it returns true. The wrapper employs a SignRawTransactionRequest class matching the four arguments of the rpc call. It allows for 'inputs' and 'privatekeys' to be null, following the signrawtransaction syntax, while assuming 'sighashtype=all' unless explicitly specified otherwise. 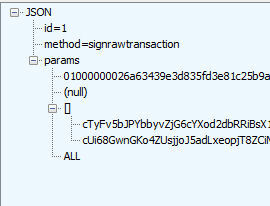 The request if fed to the wrapper method RpcServer.SignRawTransaction and returns a SignRawTransactionResponse containing the result and the hex as returned by the server. However, it returns false when the second optional argument(list of private keys) is used. It has been tested with one, all, and various combinations of the available private keys of the wallet. I suspect it might be a JSON error and that the wrapper is not constructing that part of the JSON properly, however that usually leads to a parsing error and not the false reply I get here. 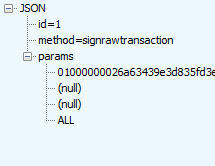 The same combinations return true when signrawtransaction is called from the console. Any ideas on what might be wrong with the private keys argument? This was not a case of BitcoinLib malfunctioning in any way. It was simply a case of using wrong privkeys to sign the unspent outputs. Not the answer you're looking for? Browse other questions tagged json-rpc private-key c# or ask your own question. How can I copy an address (with the private key) using JSON-RPC?